Dodge Charger without any flaw maintained its image since 1966; however the nameplate almost disappeared in year 1977. 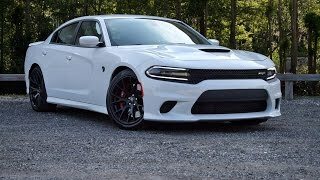 After bringing some revised models in 1982, 1987 and 2006 company is here for the year 2015 introducing its all new Dodge Charger SRT Hellcat 2015. With unmatched power beneath its aggressive body, interior too features some comfort and luxury. Let us have a closer look to this new introduction in a descriptive manner. Dodge Charger SRT Hellcat 2015 now comes with a sporty interior with major changes being a flat bottom steering wheel, larger illuminated TFT display’s control buttons. Seats now get treat of comfort through improved cushioning. While front seats get heating and ventilation feature, rear seats come standard with only heating. The SRT Hellcat package with it also includes 18-speaker Harmon Kardon audio system of 900 watt. The multifunction mounted steering wheel comes standard with 360 degree heat element. Illuminated center console displays mixed essence of red and green, giving it a sportier look while center of the wheel portrays SRT embossed on it, making it different from its predecessors. Exterior of Dodge Charger SRT Hellcat 2015 holds everything to take you in the limelight. Starting with the front fascia, we noticed no change in the headlamps however the grille gets an entire new shape and design with its honeycomb pattern and an SRT badge in between to add to the glory. Bumper incorporates larger air intakes and a splitter to look after airflow till engine. Oh yes Engine!! It now resides beneath an all new designed power-bulge aluminum hood which constitutes cold air intakes and dual air extractors, maintaining the temperature inside. Now marching ahead to the rear fascia of Dodge Charger SRT Hellcat 2015 gets little more of revision in comparison to face through its, trunk lid spoiler, exhaust tips with diameter of four inches, and side bumper inlets. 19” standard seven-spoke forged aluminum wheels are also a commendable addition. 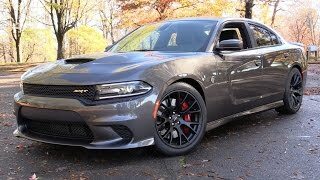 Dodge Charger SRT Hellcat 2015 gets its power through a 6.2 Liter HEMI V8 engine that produces total output of 707 HP and peak torque of 880 nm paired to eight-speed automatic transmission. 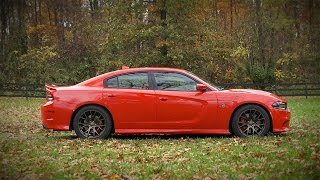 With this enthralling power rolling the entire Dodge Charger SRT Hellcat, it can reach a top speed of 204 mph while quarter mile time keeps the slim long needle at 11.0 seconds. Dodge Charger SRT comes with five driving modes; Eco, Default, Sport, Custom and Track with track being the one unleashing entire power inside its engine.